Product Review -- Cretacolor Aqua Stic artist grade watersoluble oil pastels. Cretacolor Aqua Stic watersoluble oil pastels are artist grade, medium-hard, long narrow wrapped sticks available in sets of 10, 20, 40 and 80 colors as well as open stock. These are the brand of choice for artists who have health or allergy problems with oil painting mediums, because you can use water for all your wet effects. They blend well with other brands and work well for early layers because of their hardness. 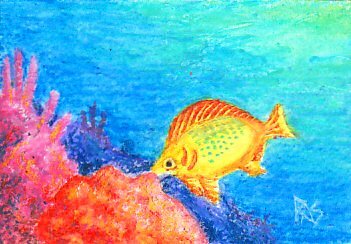 Here's Fish and Coral, a small painting I did with my full range set combining wet techniques in the fish and water, dry techniques on the coral and fish, and sgraffito for details on the fish. Fish and Coral, 2 1/2" x 3 1/2" by Robert A. Sloan. Created with Cretacolor Aqua Stic watersoluble oil pastels over an underpainting done with Cretacolor Aqua Monolith woodless watercolor pencils. One of the great advantages firm oil pastels have is that you can get more detail with them, especially using careful blending and sgraffito techniques. Fish and Coral is an art card only 2 1/2" x 3 1/2" and the scale of detail such as the ribs on the fish's fins or its delicately carved and painted eye were easy to accomplish with Cretacolor Aqua Stic watersolubles because they had the stiffness to stay in place when I pushed the color around with a small metal tool. I used a blunt fingernail cleaning blade on my nail clippers as my sgraffito tool with these. This brand didn't exist when Kenneth Leslie compiled and wrote Oil Pastel: Materials and Techniques for Today's Artist. He just wished it did, in one passage mentioned a growing need for a good watersoluble oil pastel that's artist grade. Cretacolor's product is lightfast, brilliant, varies in opacity from semitransparent to opaque and firm in texture, comparable to Cray Pas Specialist or Van Gogh Extra Fine. Like other brands, it responds to temperature. When I first tried a Prussian Blue sample stick, it was chilled by sitting outside in the mail and I thought it was way too hard and crumbly. Two days later I tried it again at room temperature and liked the texture. If you find them too hard, warming them with your fingers or a slow gentle heating like placing the set under a lamp (watch out for melting if it's too close to the bulb) will help them spread easily. Pigment saturation is excellent and light goes over dark well. The light colors are more opaque than some of the dark ones. Once dissolved with water, these fall somewhere between transparent watercolor and opaque watercolor (gouache) for transparency. They are more vivid than Cretacolor's Aqua Stic watercolor pencils and much softer, going down in heavier layers with the same application. This makes them good for sketching and sketch-wash techniques. The sticks come sharpened to a crayonlike point, which allows a bit more detail than blunt sticks. They can be sharpened even finer with a knife or a crayon sharpener because they have enough firmness to stand up to the process, and the shavings can be saved and dissolved for liquid color. At about a dollar a stick in sets online, these are medium price, up in the range of artist grade prices but down at the lower end of the artist range costs. Cretacolor has a distinct look to its tins of color products, their designers lay them out in dramatic vees and slants and zigzags and the Aqua Stic tin is no exception. On sizes 20 or more, the long sticks are laid out angled in a styrene tray that fits into a hinged lid tin. The full range set has a second tray with cardboard lifting tabs on the sides that fits neatly into the lid when you spread it out. I found the sticks a little hard to get out of the tray, but that's a minor complaint. Only the sticks on the end have openings in the middle to get your finger under the stick, for the rest it helps to get the stick next to it out before pulling it out. The tin doesn't have any printed artwork on the outside or inside, but does include a paper insert with the color range and information about the product and other Cretacolor products. They are a wonderful adjunct to water media mixed media projects, because of their vividness and easy solubility. 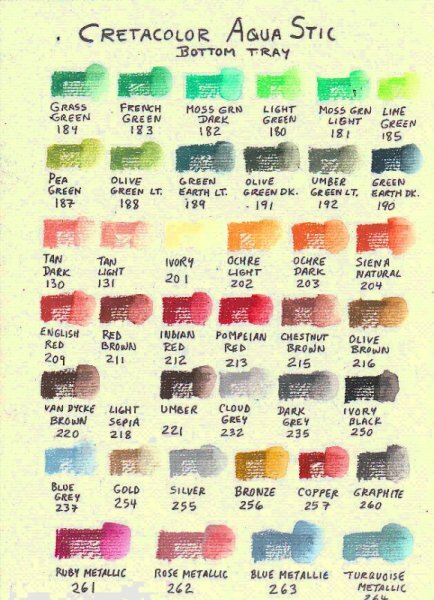 The slightly waxy, translucent look of the wash is distinctive compared to both transparent watercolor and opaque watercolor so it can be used to create passages that have their own look. My brush strokes didn't smooth out completely in the wet area, some of the color pushed around but it didn't have the crisp hard edged strokes I'd get with gouache. One exciting possibility I'll experiment with now that I have both artist grade watersolubles and oil-based oil pastels is to combine both in the same painting and do differential washes. Combining these with oil based ones and washing with water would leave the oil based areas dry and the waterbased washed, or vice versa. I'll do a page on combination effects when I try this, it's on my list of experiments. Easy solubility makes these a good choice for self-underpainting -- just scribble in your first layer lightly, wash over color areas separately with a lot of water and let it dry. Then work dry and consider a second wash. I will be including all the stages of Fish and Coral in a Fish and Coral Demo page later today so that you can see how these performed at different stages. The results for an example artwork satisfied me that buying the full range set was a good choice. I know I'll use these often. 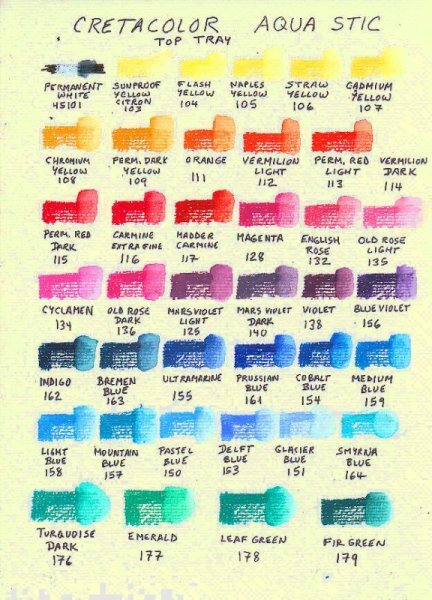 Here are color charts for both trays of my 80 color set. My scan is adjusted as close to reality as I could get it, but if you get a chance to look at these in a brick and mortar store it's easier to choose colors precisely. The long sticks make this set an added bargain too, as they will probably cover more area than the standard length sticks even if they don't fit in standard pastels boxes. Cretacolor Aqua Stic top tray colors, shown dry at full saturation, dry with a lighter application and washed. Cretacolor Aqua Stic bottom tray shown with full application, lighter application and washed for each color patch. 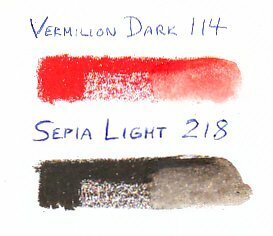 My set had a factory error -- two Permanent Red Light sticks but no Vermilion Dark stick on the top tray and on the bottom tray, two Van Dycke Brown sticks and no Sepia Light. Blick gave me a small discount on the price when I reported this factory error because they don't carry Aqua Stic in open stock, so I ordered replacement sticks from Jerry's Artarama in the two colors I didn't have. Vermilion Dark is a color that's full strength, it fits neatly between Permanent Red Light and Permanent Red Dark in a progression by hue from orangy warm reds toward cooler purplish reds. Sepia Light is extremely dark and a very cold, yellow-greenish leaning brown, farther from the warm red browns than Van Dycke Brown.